Angela-The message is that American Apparel has job opprtunities to offer to many different types of people in different arenas. 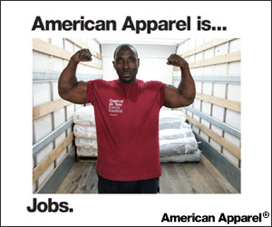 The pictured employee is one of many employees AA has depicted in it's advertising. Eye candy or not. American Apparel employs thousands of people at it's Downtown Los Angeles factory where this employee is standing (infact NOT a stockroom). In a climate where job availability is few and far between I think an advertisement that celebrates the fact that an American made company can still offer jobs to it's citizens is a resonating point.